Impatiens Bach flower essence is a perfect match for its own name, as it relates to the qualities of patience and gentleness. In a negative Impatiens state, impatience, inner tension, and a general air of irritation predominate. The Impatiens personality is quick-thinking and wants to work at a fast pace. When supervising others, this personality feels the urge to just "do it themselves" rather than suffer the frustration of watching someone else work slowly or not up to their standards. When forced to work with others at a slower pace, the adaptation to a lower energy level takes a toll - creating a constant, energy-draining mental tension. Because of their high standards and tendency to push others, Impatiens bosses can quickly become referred to as slave-drivers. But the true Impatiens person doesn't want to be the boss. He would prefer to work alone, keeping his own pace with no interference from others. He treasures his independence. Because these people move quickly - both mentally and physically - they become worn out quickly as well. They are also accident prone, but less likely than others to be seriously injured because their quickness can pull them out of situations as easily as it put them into them. In the negative Impatiens state, this personality fails to see that each person is a part of the whole, and that we all depend upon each other. He also does not believe that those most capable have any obligation to share their gifts in service to others. When in an extreme negative Impatiens state, the usual outward signs such as rapid speech and nervous gestures may be turned inward - causing skin rashes and other irritations. When in the positive state, Impatiens people have great capacity for empathy and patience. They still possess quickness of mind, intelligence, and decision-making, but they put them all to good use in the service of others as well as themselves. 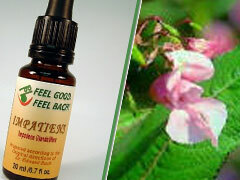 This Bach Flower remedy is useful in bringing the negative Impatiens personality back into its positive state, but is also useful in daily life for those with other personalities. A smart mother will keep this Bach Flower Essence on hand for those times when the children's squabbles or temper tantrums have destroyed her patience. Interestingly, this treatment will aid the children directly, and will help the mother regain her lost patience. A child who shows strong Impatiens traits should be gently guided into a profession where he or she can be independent and self-reliant.